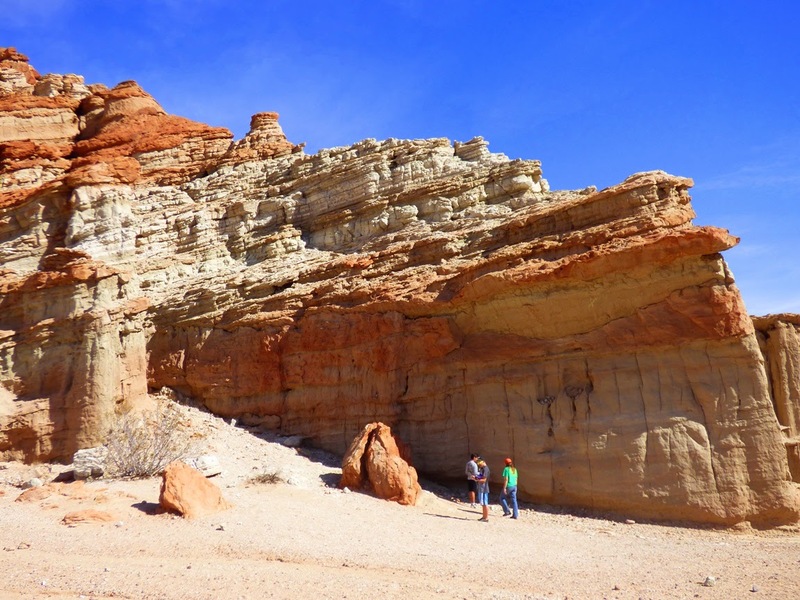 Red Rock Canyon State Park is one of the gems of the California State Park system. It has the kind of scenery that makes drivers on Highway 14 out of Mojave hit the brakes out of disbelief. 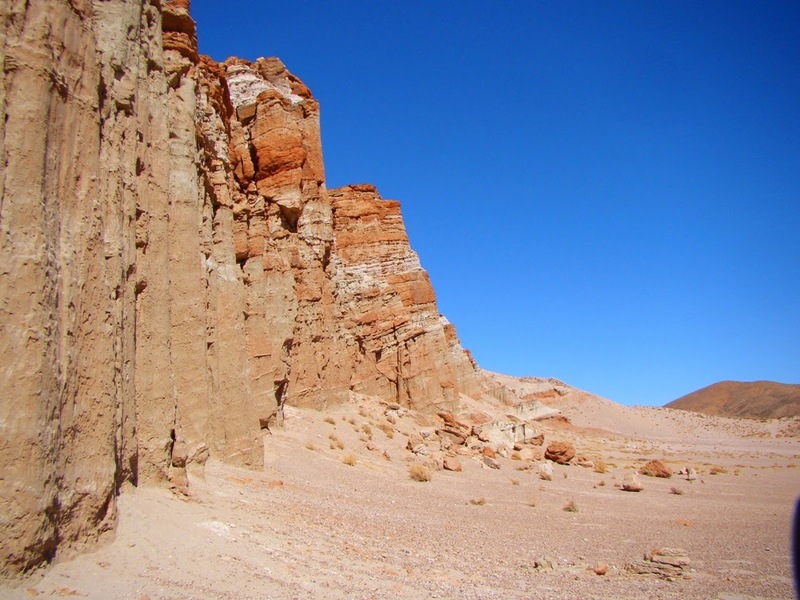 The cliffs rise out of the desert due to some serious slippage along the Garlock Fault. The exposures of the Dove Springs Formation (formerly the Ricardo Formation), besides being scenic and colorful, contain a fascinating fossil fauna of life that existed in a savanna environment around 12 million years ago. There were horses, camels, ancient elephants, and a host of predators including some early species of saber-tooth cats. 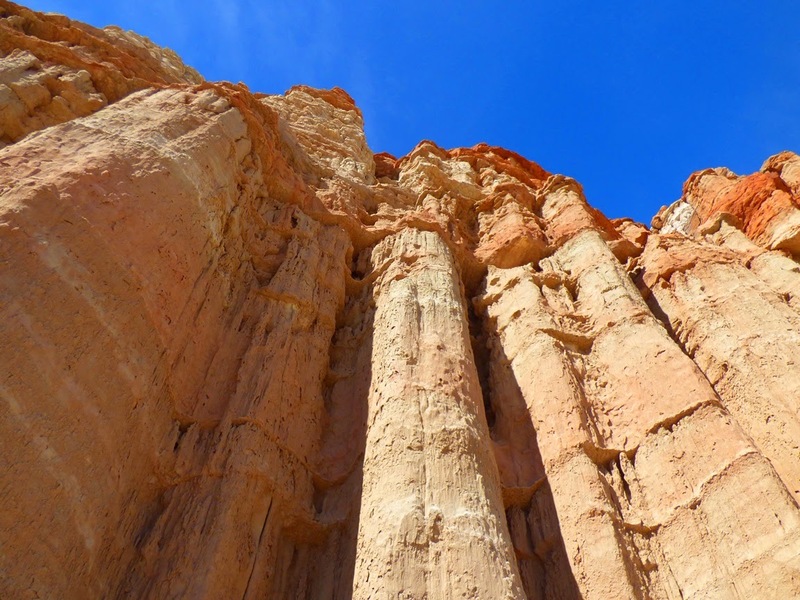 Generations of geology students have done field studies in the park, as it provides marvelous opportunities for developing stratigraphic columns, with excellent exposures for geologic mapping. 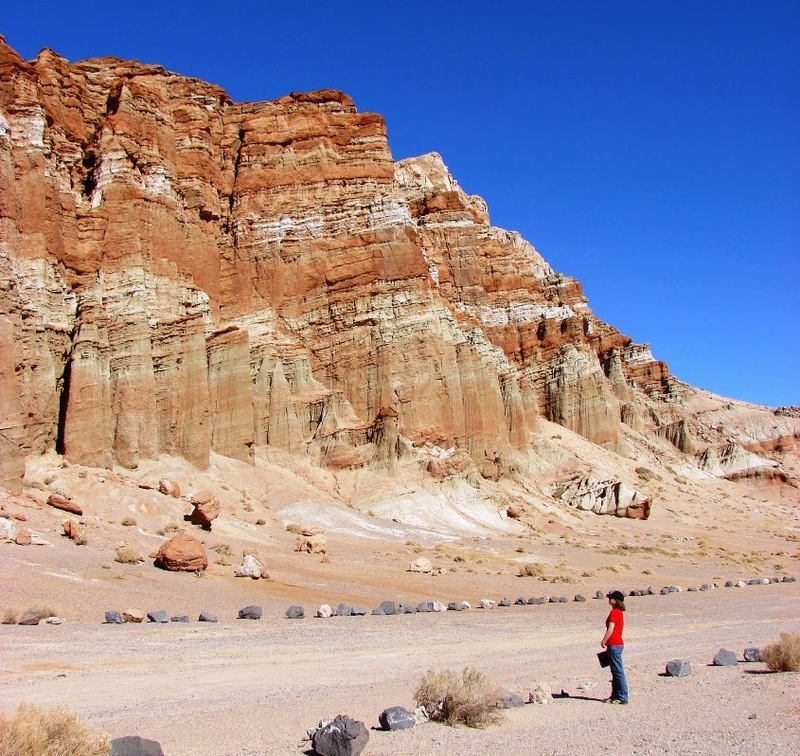 Many of my students have had their first introduction to basic geologic and stratigraphic principles, as it is one of our first stops on our yearly Death Valley expedition. I'm writing about a threat to this beautiful park. Many parks, both state and national, have a heritage of mining, some successful, most not. The remains have become part of the park experience, but in many cases mining claims were "grandfathered in" when the parks were established. By keeping up with various small rules (for instance, doing a small bit of assaying each year) these companies retain a legal right to mine. Such is the case at Red Rock, where a company intends to develop an open pit mine at the site of former underground workings. They intend to mine "seismotite" (volcanic ash), pumicite and bentonite clay. 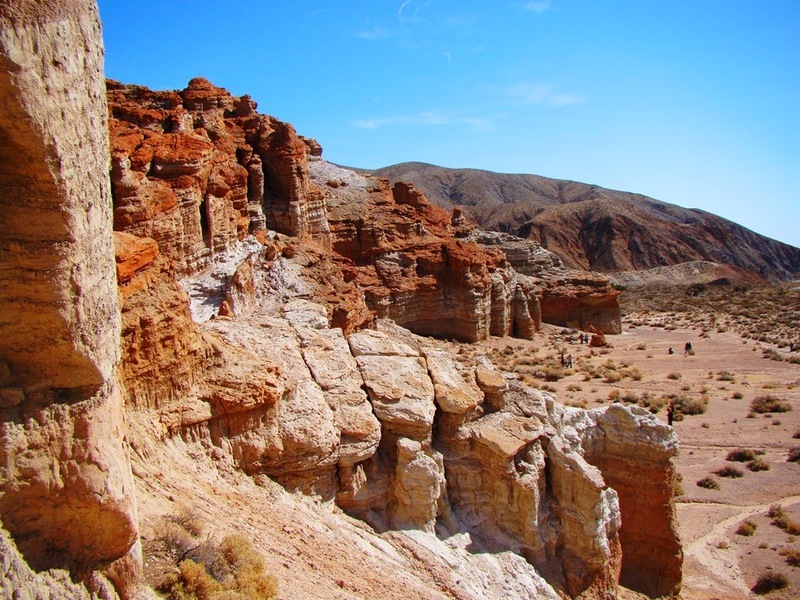 Scenic vistas of the pristine environs of Red Rock Canyon State Park could be compromised by a mining activity taking place inside the boundaries of the park. Air quality could be adversely affected by dust from a mining operation. Wildlife including the Mojave ground squirrel, the Desert Tortoise, the Desert Kit Fox and Burrowing Owl could be impacted by posed threats that can result in deaths, injuries and harassment of these species many of whom have special-status as endangered and threatened species. Ecosystem existing at the proposed site could be affected by vehicles and heavy equipment since the Old Dutch Cleanser Mine is foraging terrain used by golden eagles; prairie falcons; pallid bats, Townsend's big-eared bats and spotted bats. There could be a negative impact to rare flora including the Red Rock tarplant. Significant Cultural areas of Red Rock by the Native American community are in the vicinity near the proposed project site. A mining operation in this region could disturb the grounds which are revered and respected in the Native Community. The quiet solitude that park visitors and tourists come to Red Rock to enjoy could be replaced by the noise of mining. Disregard to the spirit of the California Desert Protection Act of 1994 that includes California's State Parks such as Red Rock Canyon State Park which provides for the maximum protection of the area's scenic and scientific values, erodes the integrity of our legislative system. Disregard to the intention of the Endangered Species Act of 1973 to protect the Desert Tortoise which the United Fish and Wildlife Service has stated is within the project site would exhibit an insensitivity to our protection of habitats. There are potential impacts to both recreational users and sensitive and endangered species on the routes that would be used by both the public and large haul trucks and water tanks . Transportation and traffic is based on a right-of-way that is antiquated since it pre-dates both the California Desert Protection Act and the Desert Tortoise being listed under the Endangered Species Act. There are other areas of concern such as impacts on recreational users; movie and commercial location filming and night sky observers just to name a few others, so please make your voice heard. It appears that forces are coming at Red Rock Canyon State Park from almost all sides. We seem to be surrounded by opportunistic endeavors that have no interest in protecting the treasure that is Red Rock Canyon State Park. We have a small window of opportunity. The Kern County Development Services Agency is open to receiving comments from the public and all interested parties about plans to allow Matcon Corporation Inc. to continue mining 17.23 acres of the mine known as the Old Dutch Cleanser Mine located inside the boundaries of Red Rock Canyon State Park. These mining activities, if allowed to proceed, would use open pit mining techniques to mine seismotite, pumicite and calcium bentonite clay six days per week for 10 hours per day. The mine inside the boundaries of Red Rock was grandfathered in. The mining operation of the past is out of sync with the intention of our forefathers to steward the wilderness with the creation of the Parks Department exactly 150 years ago. Times have changed. We are no longer the Wild West; although the systematic negation of good land steward practices and rejection of common sense arguments in recent years to protect our resources would have us question this notion. We are a State Park. We were created to protect and conserve land as well as allow recreational activities for the enjoyment of the entire public. We were not given the designation of State Park with the intention of exploitation of mineral and natural resources for the gain of individuals or corporations/agencies. Let us hone in on the values and handling of resource management and make our voices heard. Let our local agencies know that open space and irreplaceable natural treasures like Red Rock Canyon State Park are of exceptionally high value that exceeds any monetary value gained by desecrating the landscape for the profit of the few. It is up to individuals like you to care enough to do something to protect our treasure and not allow anyone or any group or agency to rob future generations of the majesty of Red Rock. The comment period for the document Mitigated Negative Declaration Notice of Availability for Public Review for 5562RPC; Conditional Use Permit closes on December 18th, 2014. PLEASE SUBMIT COMMENTS BY THIS DATE as "testimony at future public hearings may be limited to those issues raised during the public review period either orally or submitted in writing by 5:00 p.m., the day the comment period closes," according to a letter signed by Lorelei Oviatt, AICP, Director Planning and Community Development Director. The public hearing originally scheduled for Thursday, January 8th by the Planning Dept. of Kern County on the proposed cup for re-opening the Old Dutch Cleanser Mine has been "continued," and no future date is set at this time. We asked for your assistance in submitting comments to the Kern County Planning Department. An "outpouring" of support and letters was inspiring. The response by Kern County Planning Department, to give consideration to the arguments was gratifying. The Project Analysis said, "Staff has reviewed the documentation received as part of the document's 30-day circulation...." "...staff recommends that your Commission refer this matter back to Staff for further environmental review.". Red Rock Canyon is such a beautiful place, it's terrible that they even consider doing that. I've just written to them and hope very much it will help. Thanks for putting this on your blog.